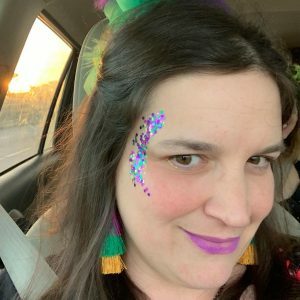 Jen is a New Orleans local (not a native – that’s a very different breed) who divides her attention between books, friends, family, and Mardi Gras. She is a contributor to the New Orleans Moms Blog, a locally focused parenting site made up of over three hundred thousand readers. She has also provided guest contributions to New Orleans Living Magazine. When she’s not volunteering at her two little bug’s school (one boy, one girl) or staring blurry-eyed at her computer searching for words, she enjoys being active and adventurous. In addition to completing Tough Mudders, Jen can be found walking at the park, taking HIIT classes, and swinging Kettlebells around the city. She loves chats at coffee shops with a good friend and insists on having a family fun day at home once a week. Those days are for couch time, completing puzzles or playing Nintendo while her Beagle mix Maddie snoozes on her lap and her fat cat Cinco hangs nearby. After a twenty year career in Software Engineering, Jen decided to switch gears and share the stories she’d written privately since a young girl. She is currently working on Dark Rooms, her first novel. It centers around two people who discover they are both missing the same chunk of time, share similar scars, and have a connection that goes beyond the casual friendship they expected.